Organizations that invest in developing a talent pipeline as part of their strategic business planning will find that the process can increase employee engagement, build loyalty, reduce turnover, and lower costs. 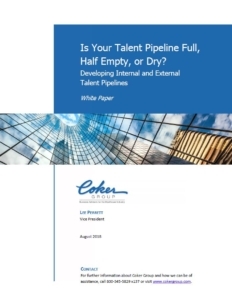 When coupled with adding top external talent to the pipeline to fill positions that cannot be placed internally, the strategic value will only be enhanced. Employers that keep a steady source of talent maintain an advantage over their competition through their ability to sustain the growth and development of the current and future leaders of the organization. What’s in your pipeline?